OSHA’s new silica rule lowers the Permissible Exposure Level (PEL) for respirable crystalline silica to 50 µg/m3 , as compared to 100 µg/m3 in the old rule, measured as an 8-hour time-weighted average (TWA). Simply put, facilities must ensure that their employees are not exposed to concentrations of respirable silica above the PEL over the course of an 8-hour shift. To verify this, air monitoring should be conducted for all affected employees. The results of the air monitoring will determine if any additional sampling or control measures must be implemented. Sampling may be discontinued if the air monitoring results show that employees are not exposed to concentrations below the Action Level of 25 µg/m3. If results are at or above the Action Level, but below the PEL, then sampling must be re-conducted within 6 months. Lastly, if sample results are above the PEL, sampling must be re-conducted within 3 months. The results of all air monitoring must be shared with your employees along with any corrective actions that may be necessary. Employees (or their designated representatives) must be allowed the opportunity to observe the monitoring procedures for determining the levels of Silica dust in the workplace. The new silica rule also requires facilities to establish “regulated areas” where workers could be exposed to hazardous concentrations of respirable silica, based on positive results from an air monitoring survey. These areas must be marked with notification signs and respirators must be offered to anyone who enters into the areas (remember that there are additional requirements for employees who don respirators). 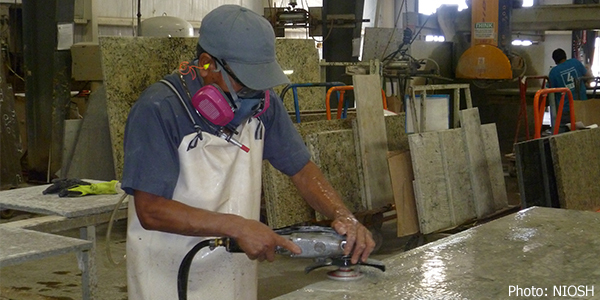 Facilities must also develop a written exposure control plan that identifies tasks that may expose employees to respirable silica as well as actions taken by the facility to minimize employee exposure to silica, such as respirator usage and good housekeeping practices that minimize the use of compressed air and dry sweeping. Medical exams should be offered to employees who are exposed to levels at or above the Action Level for 30 or more days per year, and records of these exams should be maintained by the facility. The facility should ensure that their employees are trained in recognizing hazards associated with respirable silica as well as methods that can be taken by the employees and facility to minimize exposure. It is important to be sure that your facility is in compliance with the requirements set by the updated rule to keep your employees safe from the hazards associated with overexposure to respirable silica. If you would like more information regarding the new rule, or if you would like to discuss what you should do to come into compliance with the rule, please contact CTI at www.conversiontechnology.com/contact.